Brought to you by Vast Studios, creators of the Nightfall Mysteries and Dark Canvas series, comes a thrilling new fantasy brand! You're an Ambassador from a distant kingdom, carrying a prince's marriage proposal to the lovely Princess Selene. But Selene has been having recurring nightmares that her kingdom will be destroyed if she marries. She refuses her heart's desire... and a mysterious spell suddenly sinks her into a deadly reverie. The heartsick Queen binds your life to Selene's – if you don't save her, you'll die, too! Can you find a cure in time - or will both your lives be forfeit to Selene's visions? 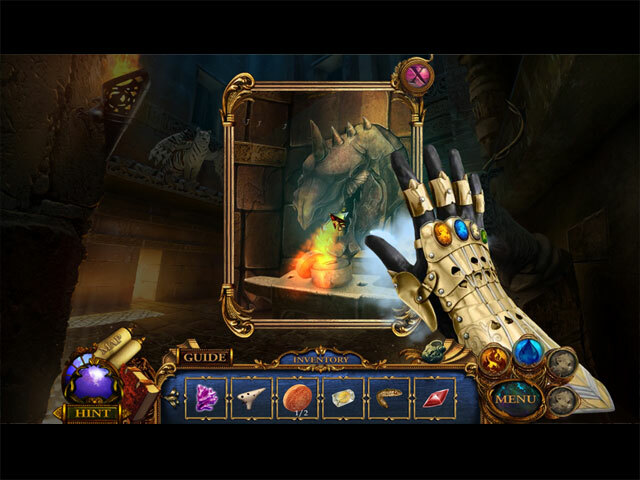 Find out as you travel through distant lands in this exciting Hidden Object Puzzle Adventure game! 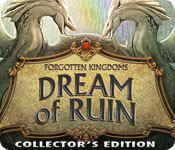 Forgotten Kingdoms: Dream of Ruin Collector's Edition is rated 3.3 out of 5 by 72. Rated 3 out of 5 by kdreetz from Torn - do I buy or not? This game could have been so good. The one thing missing were black bar tips. Beautiful graphics, quite an interesting storyline (never hand deliver a marriage proposal! ), flying around on one of Siegfried & Roy's white tigers, lots of achievements and cards to collect - which I'm sure lead to some cool puzzle at the end. I like various HOS's so that was another plus and the puzzles weren't too mind-bending for intermediate/advanced players. So I'm torn. I still like to play on casual, but this game on the easiest mode was similar to playing expert. Not much help on what to do with your inventory items and I had to use the SG constantly - which I try to avoid unless really stuck. I guess this one goes into the "maybe" pile. Too bad because it had very good potential. Rated 3 out of 5 by chrmn2k from Not for the Beginner! I'm glad that I read the reviews before I purchased this game. I agree that is was frustrating and I spent forever waiting for the recharged Hint so I could decide what to do. A puzzle without the Skip option took longer than I liked. Even though it has the potential of winning game of the year, I wouldn't purchase this game as a CE. I did so poorly without the Hint that it wasn't an enjoyable or relaxing game. If you like a challenge, you will love this game. I played on casual, but it was still too difficult. What a shame because the story, graphics and dinosaurs were terrific. Good Luck! Rated 3 out of 5 by Anangelsprayer from Vast had an oops As Vast is one of my fav devs, this game to me didn't cut it in a lot of ways. I love the black bar tips to help me, instead I find myself constantly using the strat guide too much because of this reason. All we were getting was worthless comments that got old quick. You felt like you were wondering around aimlessly. This game was just o.k. to play. H0GS: Same old every time. A list, one green word that's it, no variation. Played better in SE's. Mini Games: Didn't find one I particularly liked. The color one was frustrating. Map: Jump map. Graphics: Gorgeous Hint System: Not all that helpful. Didn't tell you what to use where. Took too long to charge even in Easy Mode. Sorry devs that I couldn't rate better, but I want to rate fairly. Rated 3 out of 5 by flutterbyz24 from A Ruined Game I have played this game for an hour and have made it through 2 chapters. There are 3 chapters available in the demo. According to the strategy guide there are 5 chapters with a bonus chapter. Pros: Artwork is beautiful. Colors are glorious. The storyline actually has some uniqueness to it. There is a flying tiger which I've not seen before. Cons: Frustrating at times. You click on an area that has gears yet no hint as to what is needed there. You have to try everything in your toolbox or consult the guide. When the story from the past is told you must have your sound on. There is no closed captioning for it. I rarely play with sound so this was a big irritant. I found myself using the guide too much because of my frustration level. This game has potential - but I won't be buying it as a CE. I hate to say I don't recommend a game - but I can't in good consciousness say "buy it". Rated 3 out of 5 by suzstchs from Has potential This game could be interesting, but there are so few instructions that time is wasted getting to the next task. Graphics are great, story line is promising, but needs more work on the technical aspects of the game itself. Rated 3 out of 5 by MSBAM100 from Save the Ambassador and Selene! The developers took a good story line and then messed up the execution of the game. I finally had to quit the demo in frustration! You are the ambassador sent by Prince Armus of Area with his marriage proposal to Princess Selene of Tida. When Selene opens the proposal, see shes her nightmare vision of fire destroying her kingdom and her mother dyting. She then collapses bound by chains and green smoke. You are given the task of saving Selene, or else you too will die. Unfortunately, you don't get a lot of help to do it! The game has sparkles to indicate something should happen, but no clue or help is given. The help button just points to something or perhaps out of the room. I had to use the strategy guide quite often after giving up on what object I needed in what area. The HOS were all lists; the mini-puzzles were hard -- also with often no information about what needed to happen. You eventually get a map -- needed the S.G. to find the last piece! But it doesn't really help. This could have been a very good game, but the lack of direction ruined it for me. Rated 3 out of 5 by biscuitsmama from This Kingdom Should Be Forgotten In Forgotten Kingdom Dream of Ruin you play the game as an ambassador of your prince who desires the hand of the princess Selene in marriage. As you deliver the marriage proposal to the princess, she is suddenly bound by a mysterious curse. The queen suspecting that you may have something to do with the evil curse that has befallen the princess, binds her life to yours and you have only two days to find a cure to save not only the life of the princess but your own as well. Travel the kingdoms with the aid of your magical flying tiger where you will encounter mystical and wise dragons, mischievous pixies, and other wondrous creatures. Will you meet the challenge and find the cure that will save the princess Selene? The graphics are mediocre at best, but with lovely artwork and great use of color. The game has voiceovers that are okay but not great and, of course, there is no lip-sync. You have a very basic journal with two sections: one for objectives and the other for clues. One of your first tasks in the game is to piece together your interactive transporter type map. You have another tool; your flying tiger that helps you navigate from one kingdom to another. There are various types of interactive HOPs, some are the standard list type and others are silhouette type. The puzzles seem easy, although I did end up skipping one of the more difficult ones early in the game because I didn’t feel like putting more time into solving it. It is a shame to call this game a CE. The CE content contains the strategy guide and nothing else aside from a few collectible cards to be found throughout the game. I think, and this is only my opinion, that this game should have been released as an SE because it truly doesn’t deserve the CE label. The story is slow and almost seems plodding. Those gamers who hate sparkles and black bar tips should find this game to their liking since there is very little hand holding or help along the way. Although the game moves slowly in the beginning, it does improve once we leave the palace and I did find myself being drawn into the story in a bit more. In all honesty, I only got the game because I had a free CE coupon that was ready to expire. If not for that, there was nothing about the game that drew me in to the point where I would have wanted to buy it. I am sure that there are some gamers out there who will really enjoy this game. It is not a terrible game and does improve somewhat as the game develops but it is not one that seems very exciting. As always, I recommend that you at least try the demo to see if this is a game you will like. Rated 2 out of 5 by campingramps from Complete waste of time This is one of those games that I get the impression they were trying to write for kids. Story is lame as are the characters and the settings. Maybe if I was 10 I would like it but this is not for adults. Graphics are poor at best and the music is just annoying. I don't see how games like this keep getting 5 stars, they simply aren't worthy. But, hey, if you enjoy them, go for it. I don't recommend this one. Rated 2 out of 5 by Rckrgrl74 from Needs Work In honesty, I only played about 20 minutes of the demo. This game is near impossible to figure out. I opted for the setting with the most help, as I have not yet played "Forgotten Kingdoms" anything. It didn't help at all. At every turn, I clicked on something only to get the moving gears and no explanation of what to do. Better yet, I would get a magnifying glass yet there would be nothing to look closer at. The game is quite a beauty and had I stuck to it, the story line seemed to have promise. It's a shame I left wanting to punch my computer screen and didn't complete the demo. If I had chosen a harder option of game, I wouldn't have been upset at the lack of help. I'm a very casual player - I'm not all about not knowing what to do. Rated 2 out of 5 by godfreygirl from Stopped playing soon after beginning....NOT a good game!! I would have given this game at least a fighting chance even after reading the negative reviews, but that didn't work. The bad reviewers are right. When you open a window with a task, there are NO directions as to what is needed there.....like "I need to find the key" or something. Not there. I kept looking at one window where the fountain froze over when you clicked it....okay, so what is needed here? Nothing gives even a hint. After opening several windows like that, I clicked "Exit" and deleted the game. I won't be considering a purchase with this one in any way. Rated 2 out of 5 by hoosierhasbeen from Could be good with little work This game frustrated me to no end. I clicked on areas of interest and nothing. No idea what I was looking at or for. I got tired after about 30 minutes of pointless wandering. I liked the idea and premise of the game but it seemed to be a low budget project. Could not believe it was a CE either. No way would I spend any money on this one. Rated 2 out of 5 by Gwenthyr from Uncomfortable game Based on demo play: The scenes have beautiful graphics and the storyline seemed ok but that is about it. The controls and interaction with the game is stiff, voiceovers feel forced, later conversations with the princess in your mind are a bit weird, in between the character and game information. All in all I would describe my experience as this game being uncomfortable. The story wasn't interesting enough for me to finish even the trial. Also, even though I don't mind it personally, it might be worth to mention that the game doesn't help much even on the easiest difficulty setting (sometimes you think it doesn't really notice you click somewhere) and the collectible items aren't much fun. If you plan to buy it, definitely try the trial first. Rated 2 out of 5 by gamefisherhooked from Fed Up!! Man, did I waste my money on this one!! I'm about an hour into the game and am so fed up with having to keep going to the strategy guide that I've given up!! I don't mind challenge but this is ridiculous. I totally agree with the other low rating reviewers about this game. Come on devs....we pay a CE price, we expect SOME hints at least. Give me back my wasted money, so I can buy a game where I don't end up hairless by pulling it all out in frustration!! I don't recommend this game for the CE price!! Wait for the SE and get THAT with a coupon code. Rated 2 out of 5 by gfehse from Coulda - Shoulda -Woulda This could have been an amazing game. But there was such a lack of intuitiveness that it was just frustrating. I did finish the game, but like everyone else, needed to consult the "Hints for Dummies" guide at every turn. I enjoy a challenging game, but when there is no hint given, guessing becomes the strategy and that's not challenging, it's frustrating. What a shame, had such potential. Rated 2 out of 5 by buster_girl from Not enough help I liked the concept of this game and the story would have been interesting had it not gone off track so often. I played on the easiest level and was soon incredibly frustrated with the lack of direction and clues and the constant need to refer to the guide. I never usually need to use the guide but this game leaves one so clueless at some points that it is necessary. I imagine it would be a great game for those who usually play at the hardest level and don't like sparkles and hints, but I play for amusement, not to induce a headache. I played the demo through, but I know that I would not buy a game when I'm playing and I can't wait for the demo to end. There is so much that can be done to make this a more enjoyable game and I hope the developers rethink this. Rated 2 out of 5 by 1RedZ from Unfinished Kingdom I am a newcomer to these games, and so I do need at least some help to point me in the right direction. This game gives you "Nothing", in the way of direction. To my amateurish way of thinking, this game felt unfinished, as though it had been rush out and elements had been forgotten. The story seemed like it could have been interesting, but it was overshadowed by the poor game play. As with all the games I play, I can't comment on the music, but the graphics were beautiful. Take it back to the lab, finish it properly, and re-release it. I would love to have another go when that happens. Do I recommend this game? Unfortunately in its present state, I'd have to say No, which I think is a shame, it certainly had potential. Rated 2 out of 5 by punky3535 from No a good game Really? What it is going on ? It is a terrible game, you don't know wnat to do, no explanation, no really a CE, it has that feeling of really old games...not for me. Rated 2 out of 5 by hazelwize16 from MISSED ITS MARK even when there are negative reviews, i've got to see for myself ... the stoyline could have been ok, tho in the beginning i thought very juvenile ... however as the demo progressed it was ok ... the gameplay, however leaves a lot to be desired ... HOs just weren't very fun ... there are no story clues when you are accessing active areas, so its hard to follow where you are going and how to find the tools to get there ... were there 2 mini games? ... can't remember ... i just can't spend my money on this one ... coulda shoulda .. Rated 2 out of 5 by jocasta1 from Very ordinary Based on the demo, this game seems very typical of a lot of recent games...yet another cursed princess! The story didn't grab me at all, but it played well, looked good, and had a good challenge level. The problem for me was that without a good story line, its just boring puzzle solving. Rated 2 out of 5 by Debbi190 from Not a good game I wish I had tried the game first before buying it. The lack of help even on the easy level made it difficult. If this gets enough bad reviews, maybe they will make a patch to fix the lack of information. I do not like using the guide all the time. Rated 2 out of 5 by steve_san from Dream of Ruin is a Nightmare to Play Prince Armus of the kingdom of Aeria asks for the hand of Princess Selene, of the kingdom of Tida, (pronounced tye-dah) in marriage. She wants to say yes, but has had a recurring dream of her kingdom in flames and her mother, Queen Beatrix, dead. When she refuses the offer, she is cursed into an unconscious state. Queen Beatrix binds your life (you're the Ambassador who delivered the marriage proposal) to Selene's life. You have to find a way to lift the curse before Selene dies. As you may have gathered from the summary, this is one of those kingdom, dragons, princess, portal, powers, and potions games. Those of you who like these games understand all the "rules" that apply here. Well at least I hope you do, because I did not. Adding to that, there is little, if any, on screen help - which I did not mind too much. Problem was that when I DID figure out what to do, most of the time it was illogical. I'm not talking fantasy game illogical, I mean just off the wall illogical. So that reduced the fun factor quite a bit. Another thing that is not fun is when the game crashes on you. This happened to me twice during the trial - so I am leery of possible bugs. The last puzzle was a painting puzzle and I don't care for those anyway so it was time to quit. 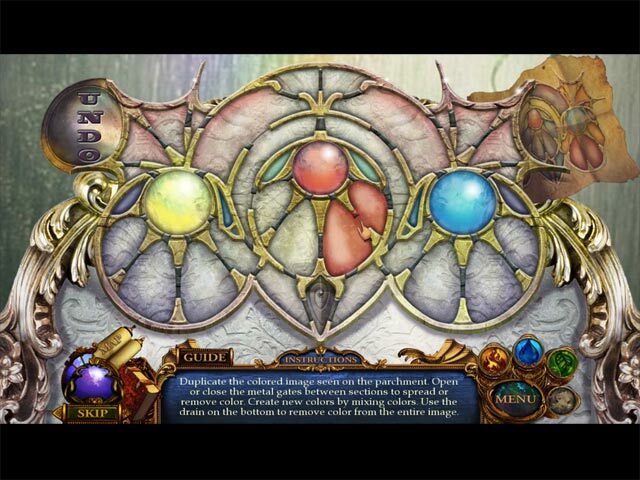 The game is puzzle-heavy (19) and hidden object light (7). There are 25 collectible cards (5 each for 5 characters) which will complete the character's stories. There are achievements and the three standard non-customizable modes of difficulty. I don't like games that I cannot make sense out of and end up wandering around without a clue. If I wanted that, I'd go play an adventure game. However, if this is your kind of game, I'd get the CE because you're probably going to need the strategy guide - that is, unless you know all the "rules" for these games. This is a dream I hope never recurs. Two fiery dragons out of five. Rated 2 out of 5 by J4016C from Not fun at all! The game does not do it for me because when the gears spin it does not give you a message. At times it is questionable what to do. I do not like that..need a clue. Other than that the game is ok...not a favorite of mine. Rated 2 out of 5 by shihtzumum from Beautiful but a loser This game was made so beautifully and story is very interesting, HOs were well done, but that's where it ends. Even though I played on the Citizen, easy, level,I was surprised to see that when you clicked on an area of interest, there was no task or description, nothing so guess you would have to guess. The 1st few scenes were do-able by trial and error and use of the guide, but as soon as you received the map, I could only find items to pick up but had to use the guide for every move I made. I'm not a dummy and have played lots of these type games, but this one was an effort of hopelessness. It is no fun to constantly have to open the guide to find what to do next, even on the easy level. How anyone could ever think they could play this on the SE version would be nuts. I'm so disappointed as I would love to see how this adventure goes, but if I wanted to read a book, I'd go to my library. You Geniuses, have at it. Rated 2 out of 5 by LogieBaby from Forget about this kingdom..........what an annoying game!! There are some fantasy games that are appealing and others that are not. Dream of Ruin is of the latter category, this is not a dream, rather it is a nightmare and one I'd rather not suffer from. Once again we find ourselves with a princess destined to marry a prince from another land only to learn there is some evil force that turns the princess, Selene, into a version of Sleeping Beauty, YAWN. Been there done that too many times. Turns out the evildoer is Beatrix, the mother of Selene. Then we get to see an apparition of Selene who tells of a quest that only we can accomplish to save her and so on and so forth..............gosh I already don't care. We have a flying tiger to take us to different areas and of course portals, where would a game be today without portals. There are some aspects of the game I really enjoyed. First and foremost is that there is very little hand holding. I thought I played the demo in the easiest mode which is what I always do in demos. When some found item is to be used as an assist, the cursor turns into a gear but there is no other help. I like the fact the game player must through trial and error solve problems on his or her own. I also enjoyed the HOG segments which were very creative and had lots of items well hidden but not impossible to locate. There were a couple of puzzles in the demo whose directions were somewhat confusing thus making the puzzle needlessly harder to complete. For those who groove on collectibles, I found none so this is one case where a CE purchase is not recommended. As has been the case with lots of new games of late it is the story itself which completely turns me off. This one borders on the ridiculous IMO. 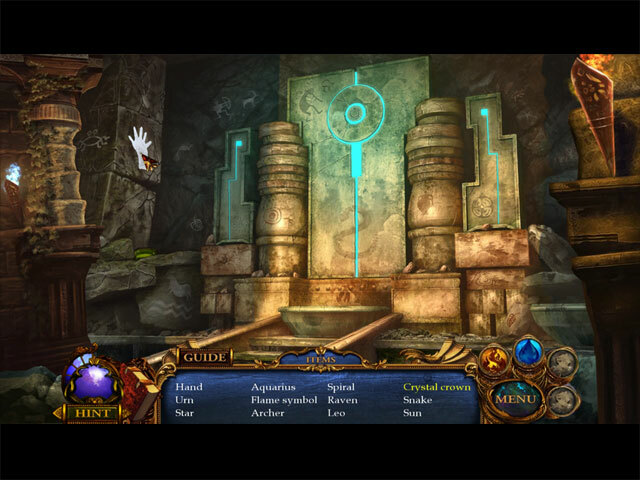 It is generally the story which compels a player to proceed with any game. Then the actions within said game is the decider as to a buy or no sale. For me, the no sale decision took about 10 minutes into the demo. I completed it hoping to find improvement. Alas, my hopes were dashed. Rated 2 out of 5 by Peta52 from Perhaps it's just me? I played the demo for just under an hour at intermediate. There are very few helpful messages - you are really on your own here. I found that the lack of them meant that I was either using everything in my inventory - because I had no idea what to do - or having to use the guide to help - ruined my enjoyment of the game. Having said that, the mini games are unusual and were fun and challenging. I changed to the easy setting to see if it would help but it made no difference. So as I said at the beginning, perhaps I am just having an 'off' day, but I won't be buying. Rated 1 out of 5 by pmax7 from Not too Fun Hidden Object Game I tried playing this game several times [unfortunately I purchased it without a test run during a two for one sale]. Never got past chapter 1. I found the game to be frustrating: 1] the hints are useless 2] the game appears to lack any logical progression I play games to relax, not to get wound up and vexed. Yes, one could read the entire strategy guide, but that kinda takes the fun out of it. Rated 1 out of 5 by 3Corgimom from Frustrating Game If it were not for the strategy guide, it would be impossible to figure out what to do in this game. This was a poorly designed game. The hints are vague, there are no clues as to what you are supposed to do. Again, if the guide were not available this game could not be played effectively. Rated 1 out of 5 by harleybeast from Don't let this "ruin" your faith in HOGs. For all the really great games from Big Fish, they on occasion have some stinkers. This is one of them. The graphics are so poor I had no idea what I was looking at, yet I was supposed to do something with it. Even in casual mode it doesn't identify key elements of the game. A frustrating game I would avoid. Rated 1 out of 5 by holofernes from Sad not to buy game I will never buy a game if I have to have the sound on. Pity because the game sounds good and interesting. Rated 1 out of 5 by Bikerider70 from Really Bad Game I cannot say much good about this game. Music and story line weren't bad but the rest is awful. I can't believe they have this as a collectors game price. Some of the puzzles did not have any info about what to do in it. Even at the easiest level, not much help. Princess Selene's vivid dreams warn that her marriage foretells disaster – but only you can break the magical spell threatening both your lives!